California topo maps are a great tool to use when you are enjoying the outdoors. 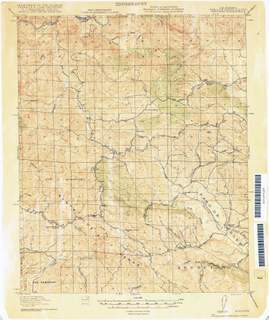 These maps are used by backpackers, hikers, hunters, canoeists, and many others. In my hobby of metal detecting, because I go off the beaten path in search of old ghost towns, logging camps, and buried treasure, topo maps are an important part of my gear. Depending on where you are, a topo can be a life saver. In some areas of California it is easy to get lost. Knowing ahead of time by plotting your course with a topo, and possibly using a hand held GPS can save your life. Before you begin your search below for a map, I am going to explain the topography of California, and why it is important to have in your possession, one of these maps. California’s topography is one of the most unique in the U.S. It has a vast seacoast, high mountain ranges, and deserts. It’s contrast in topography can be understood better when you realize that Mt. Whitney is 14,494 feet tall, and Death Valley in the State is 282 feet below sea level. The four regions of California are the Sierra Nevada in the eastern part of the State, the Coast Ranges in the west, the Mojave and the Colorado deserts in the southeast, and the Central Valley which lay between the Coast Ranges and the two deserts. The Central Valley region is a large, flat area almost 450 miles in length. This valley stretches from northwest to southeast parallel to the Pacific Ocean. Sacramento Valley is in the north, and the San Joaquin Valley covers the southern section of the Central Valley. The Sacramento-San Joaquin River Delta separates the two halves of the Central Valley. The Sacramento River is approximately 320 miles long and drains in the northern region of the Valley. The San Joaquin River is approximately 350 miles long. Both rivers meet at the San Francisco Bay. Yosemite Valley, in the middle of the High Sierra, is a narrow gorge approximately eight miles long, and one mile deep. Now, about those California topo maps. There are so many types of topos that the enormity of the choices can actually end up confusing the consumer looking to purchase one. However, because of all those choices of maps to choose from, the quality of the maps has increased over the years. Although there have been many new map producers entering the market, I believe the best topos are still being produced by long standing companies like Garmin, DeLorme, and National Geographic. Whether you are looking for California maps that are software, or a hard product like the Gazetteer, I’m sure you will be surprised at the variety and the features of the many maps that are listed below. Below is a topo I use often. Here is more information on topography. There are ghost towns in the eastern States also. So if you enjoy metal detecting, or would like a fun adventure, use California topo maps to locate these areas. Never venture into the back country without the proper survival gear, and of course a topo.